Frigg, was the daughter of Fiorgyn and the sister of Jörd. She was also the wife of Odin. Friggs wedding to Odin caused great rejoicing in Åsgard, where the goddess was dearly loved. After her wedding it was customary to celebrate all anniversaries with feast and song, and Frigg was declared the patroness of marriage as well as motherhood. Her health was always cheered together with that of Odin and Thor at wedding or birthing feasts. Frigg was also goddess of the clouds, and as such was represented as wearing snow-white garments. She was queen of the gods, and she alone had the privilege of sitting on the throne Hlidskialf, beside her husband Odin. From there she too could look over the entire world and see what was happening. She possessed the knowledge of the future, which no one could ever prevail upon her to reveal. She was good at keeping secrets. Frigg was as a tall beautiful woman, crowned with heron plumes, and clothed in pure white robes which were secured at the waist by a golden girdle. On this girdle hung a bunch of keys, the distinctive sign of the Northern housewife. Although she often appeared beside her husband, Frigg preferred to remain in her own palace called Fensalir. This was the hall of mists or of the sea, where she plied her wheel spinning golden thread or weaving long webs of bright colored clouds. In order to perform this work she made use of a marvelous jeweled spinning wheel which at night shone brightly in the sky as a constellation. This was known in the North as Friggas Spinning Wheel, while the inhabitants of the South called the same stars Orion’s Belt. 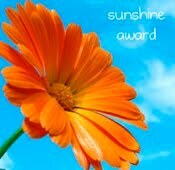 Nick Wilford at Scattergun Scribblings gave me the Sunshine Award, for my "positive nice thoughts" in comments. Thank you Nick. Because of the Upcoming A-Z challenge, Minnie is hosting Gibberish early this month. Instead of the last Friday this month she will be here tomorrow with her unusual approach to gaming. Make sure you stop by and join in the fun. These posts are fascinating - keep doing them! Well done again my friend. Congrats on your award! Thank you for thinking of me! I'm honored to get this award and I'll post on it tomorrow. Your writing is wonderfully imaginative and descriptive, good job! Thanks so much for thinking of me :D This is my first award and i'm very thankful for getting it from a very amazing blogger :) Keep up the good work! Thanks again!